At the FETC 2010 conference in Orlando, FL last week, speakers Hall Davidson and John Kuglin were joined by Leslie Fisher for a game of one-upmanship as each gave a packed house the rundown on their favorite new--and not so new--apps, platforms, and gadgets in a session dubbed the "Sandbox Shoot-Out." As a former secondary and post-secondary educator and current director of educator outreach for the Discovery Educator Network, Hall Davidson spends a lot of time thinking about how to use technology in education. For his list, he focused on software for capturing information and using it to enhance instruction. Jing: This screen capture software lets users record still images or video from of the desktop. Files can be saved to a hard drive or hosted on Jing's servers. Davidson described it as great for sharing lesson plans, recording classroom activities, and creating interactive curricula. Using a Webcam, teachers can even record and embed videos in Google Earth. The free version saves Flash-based files only; the paid service offers additional options. BT-1 Bluetooth Web Cam: Available for around $150, this Bluetooth-based wireless Webcam has an effective range (judging from the distance Davidson was able to use it) of around 15 feet to 20 feet. He said the camera is great for capturing action without being tethered to a computer. Photo Booth: Although a number of photo editing ad effects tools exist for Mac OS X, Windows, and Linux, Davidson singled out Apple's consumer-grade tool called Photo Booth. As the integrated Mac OS X software for recording videos and stills from the iSight camera, Photo Booth has several stock effects, including the ability to use a custom backdrop (from either an image or video file) to put teachers and students anywhere in the word--or anywhere in history. Poll Everywhere: A Web-based polling tool that allows users to create polls and receive results from participants via SMS (text), as well as Twitter and the Web. Results are displayed in real-time, and the service is free for up to 30 participants. Polls can be embedded into other media, including PowerPoint presentations. Davidson called a surprise guest--Denise Musselwhite, technology director from Trinity Preparatory School in Winter Park, FL--to share a tool that, in her words, "turns PowerPoint, Open Office, Keynote, and SlideRocket on their ear." Prezi: Musselwhite took a few minutes to show Prezi, a free presentation tool that lets users create a presentations from a single slide that can be zoomed in and out to show a variety of content. Paid versions of the tool are also available that provide additional functionality. Leslie Fisher, an education technology consultant for Vandenberg, CA-based Fisher Technologies Inc., focused her portion of the session on tools to help with personal productivity, organization, and communication. Etherpad: A real-time collaboration tool that can create living documents with up to 15 users at a time. Currently a pay-per-user service, Etherpad was recently acquired by Google, with plans to integrate it into the Google Wave platform. Orbicule Undercover: A $50 theft-recovery app for Mac users afraid of having their laptop lifted from their local classroom or coffee shop. When a computer is stolen, this software uses WiFi to determine the thief's location, contact local police, send screen shots of their activity, and even turn on the computer's iSight camera to take still images of the perpetrator and send them via e-mail. TripIt: A free service that lets users forward e-mail-based event reservation confirmations, flight plans, event details, and more to build an interactive itinerary that can be accessed from any computer, cell phone, or smart phone. TripIt also provides supplemental information (weather, driving directions, maps) based on specific travel plans. 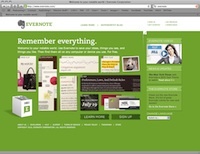 Evernote: Another free service, Evernote is designed to help take, track, and sync notes from just about anywhere. It's Web-based, works on many mobile devices, and has a text recognition tool that uses a Webcam or scanner to import notes and then turn them into text files. Twitter Widgets: These free, lightweight apps provided by twitter can be embedded in your Web site, blog, or other Web-based medium to deliver your twitter feed to an expanded audience. According to Fisher, these apps can double as a simple CMS or event tracker when embedded on a home page or events page. John Kuglin, senior technology consultant at Kuglin Consulting and retired University of Montana associate dean, spotlighted four products he actually used during the presentation to shoot, compress, convert, manipulate, and display a video file, all with the power of the cloud. Netbooks: For around $300, these small, lightweight, WiFi-enabled computers make a lot of sense when used in conjunction with the power of computing in the cloud. According to Kuglin, one can store everything from files to apps to an entire virtual operating system on the net and "free yourself up to do more with less." 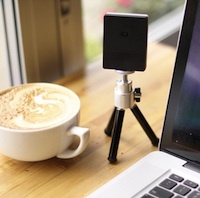 Flip Cameras: For about $150, these small USB video cameras come with built-in memory, a rechargeable battery, and decent out of the box software for editing and compression. A great option for creating inexpensive videos for sharing in the classroom and over the Web, Kuglin said. Zamzar: A web-based file converter that uses the cloud to turn video files into a range of useful formats. Content is uploaded through the site, queued, and then e-mailed back to when conversion is finished. Service levels range from free to $49 per month. 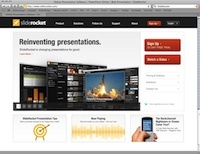 SlideRocket: An online presentation tool that allows users to upload media to the cloud, create and edit dynamic presentations, and then share or present files from any computer's browser. This is an annual subscription service with prices based on number of users. Closing out the session, Davidson gave the audience a look at the Epson BrightLink interactive projector six hours before its unveiling Wednesday evening. "Think of it as an interactive whiteboard," he said, "but without the board!" The new projector provides all the functionality of traditional interactive whiteboards, but allows users to project on virtually any flat surface. To prove the point, Davidson's demo consisted of the Epson BrightLink, some duct tape, and two pieces of foam core. "You could also use a wall, several sheets of paper, a cheap shower curtain from IKEA," he said. You get the idea.